Hiring Temporary Learning and Development Talent: DIY or Vendor? Blogs, News, and Events / Blogs / Recruiting Temporary Learning and Development Talent: DIY or Staffing Vendor—What Makes Sense? Attracting, vetting, selecting, hiring, and on-boarding temporary learning and development talent: should you do it yourself, or hire a staffing vendor? This post is a segment from our free eBook: How to Interview Temporary Talent for Learning and Development Positions. Download it today! This post was co-written by SweetRush instructional designer Tim Coffey. So you’ve made the decision to augment your learning and development team with temporary talent. Maybe you have a short-term, mission-critical project that requires specialized skills missing from your team. Or maybe requisitioning a full-time employee isn’t possible, but your budget can absorb temporary learning and development talent. Or maybe you need someone who can fill in for a team member on leave. Whatever the reason, you’re not alone. Across the globe, employers are using contingent labor to augment their teams in what’s now known as “the gig economy.” In fact, Bersin by Deloitte’s 2016 “Global Human Capital Trends” report indicates that nearly half of executives surveyed (42 percent) “expect to increase or significantly increase the use of contingent workers in the next three to five years.” And we know personally that this is happening for our clients in learning and development. There are two ways to approach the process of attracting, vetting, selecting, hiring, and on-boarding temporary learning and development talent: Do it yourself, or hire a staffing vendor. Either way, it’s a complex effort requiring a great deal of time, energy, and focus with the only question being who will shoulder the lion’s share of the work. Let’s look at some of the major challenges you might face when trying to source learning and development talent yourself versus hiring a vendor to do this work on your behalf. You do the research for where to post your ad and the Monday morning after your post goes live, your inbox looks like you put out a casting call for the next American Idol. The challenge is, there are some perfect-fit candidates in there, but you’re going to have to listen to the good AND the “pitchy” in order to find them. While a huge response is certainly better than a drought, you need a way to manage the traffic. Picture yourself keeping track of a long, long list of candidates. Who’s of interest? Who did you respond to with additional questions? Who got back to you? Who did you reject…and why and how did you reject them? How are you going to database and manage this process? If you choose to hire a vendor to source temporary learning and development talent, it’s the vendor who’s taking on the work. They’ll revise the position description to reach the targeted talent, generate interest, database all the applicants, and performs initial screenings. As you can see, your learning and development vendor’s value-add is rooted in saving you the time you would otherwise spend screening applicants. And assuming they know the learning and development space, you will see only pre-qualified and excellent candidates. A flash flood of interest can slow your response time to a grinding halt. This is often the weakest link in the recruiting chain. A high volume of interest can be overwhelming. You’ll need to respond to emails, schedule interviews in a timely manner, and, for each candidate, make a decision to advance them to the next stage or focus on others. You’re likely going to spend more time responding to inquiries and scheduling interviews than you had anticipated. Are you prepared to put your day job on hold? Juggling candidates, corresponding, and conducting screening interviews takes focus! When a vendor takes over this process, put your feet up: Your vendor is in charge of responding to each candidate. Your vendor will manage and evaluate the landscape of candidates and conduct initial screening interviews. This saves a great deal of time. And, as a nice side benefit, you preserve your company’s reputation on sites like Glassdoor.com—where candidates share their good AND bad experiences when interviewing for positions at your company. The type of learning and development talent you’re looking for is in high demand. Once a good candidate appears in your orbit, you should assume that person has other offers on the table. Be proactive, engage the process, and keep things moving forward at a steady clip. Failure to do so will result in great candidates disappearing, and your process will be back to square one. Good learning and development staffing vendors intimately know how the process works, and only get paid if you are successful in finding your candidate…so they will be sure to keep the process moving. It’s the job of the staffing vendor to not only keep candidates engaged, but keep you on track as well, so those great candidates don’t slip away. It’s key to weigh the time and effort of the end-to-end process against the cost of a staffing vendor. For some clients, the urgency of filling the role and getting the work started validates bringing on the focused effort a staffing vendor. But even if you think you have the time, be clear about the time commitment of the recruiting effort and if you can make this a priority. Think of it like building an addition onto your house: Maybe you can do it yourself. Then again, we all know even painting the kids’ room takes far longer than anticipated…and your time just might be better spent otherwise. That said, if the “project” of bringing on temporary learning and development talent seems manageable to you, if you can prioritize and focus on this effort, it might be a good time to use your DIY skills. Whichever path you choose, we’ve got your back. 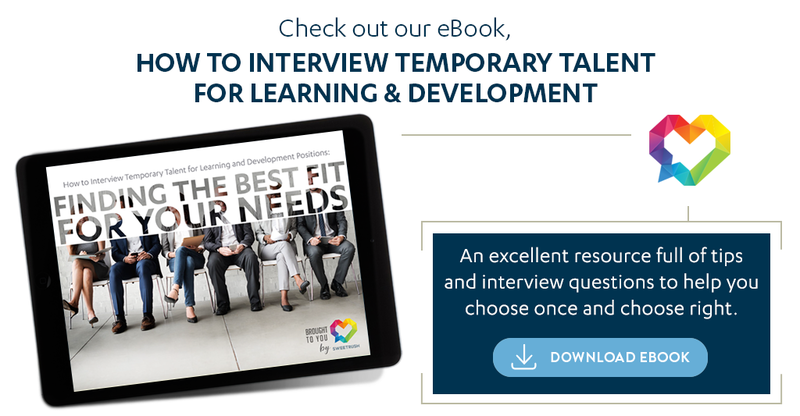 Our free new eBook, How to Interview Temporary Talent for Learning and Development Positions, will walk you through the all-important interview process and give you our best tips on interviewing temporary talent. It’s a quick download and it includes a handy Interview Questions Checklist to make your job easier. Enjoy!